"You might've tried boiling, mashing, and even turning cauliflower into 'rice'. For a different take on cauliflower, try these oven-roasted cauliflower steaks seasoned with a simple lemon-garlic sauce. Serve the steaks with chimichurri sauce or topped with roasted cherry tomatoes, sliced green olives and crumbled feta cheese." 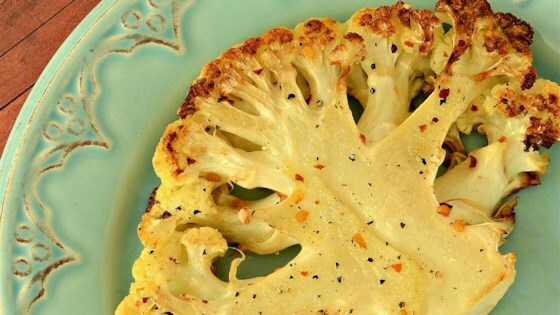 As a lover of roasted cauliflower this not only presents well, the flavors are spot on. I used Meyer lemon infused olive oil.